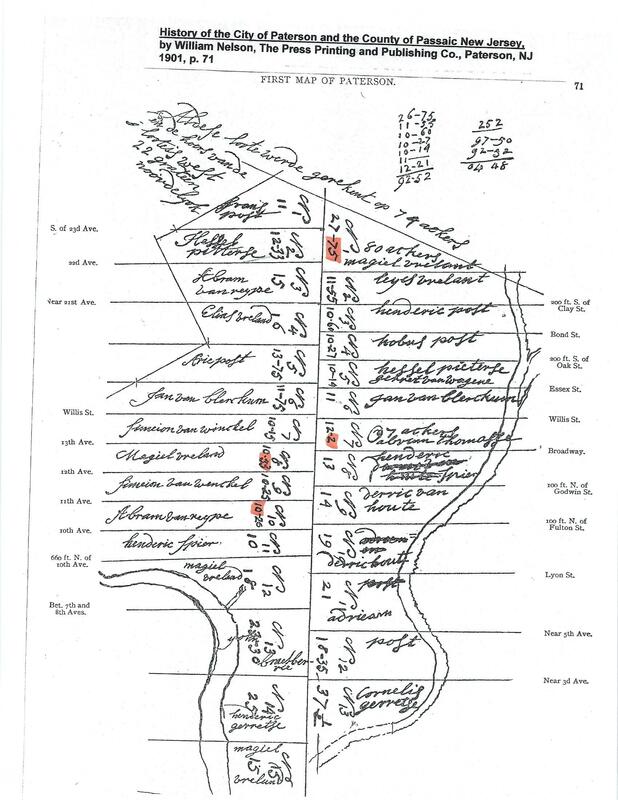 In the original patent, there were fourteen proprietors to whom 14 farms were laid out in the Acquackanonk section; fourteen in the Wesel section (that where Cedar Lawn and vicinity now lies) and 28 in the “Boght” or bend. The map referred to represents these last 28 farms. Magiel VRELANT (VREELAND, or FREELAND), which is a triangular plot, the rest being parallel-grams. This first plot is 27 chains, 27 links along the line spoken of. No. 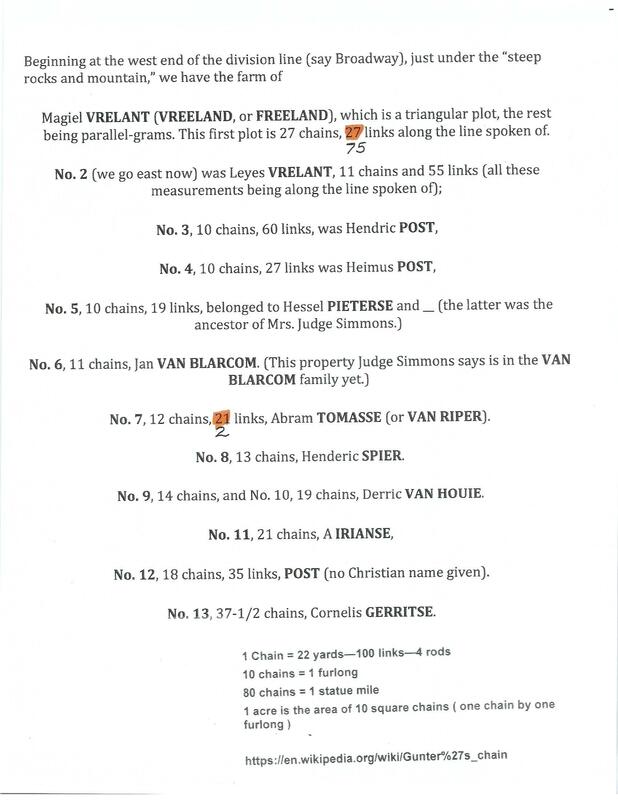 7, 12 chains, 21 links, Abram TOMASSE (or VAN RIPER). No. 8, 13 chains, Henderic SPIER. No. 9, 14 chains, and No. 10, 19 chains, Derric VAN HOUIE. No. 12, 18 chains, 35 links, POST (no Christian name given). No. 13, 37-1/2 chains, Cornelis GERRITSE. No. 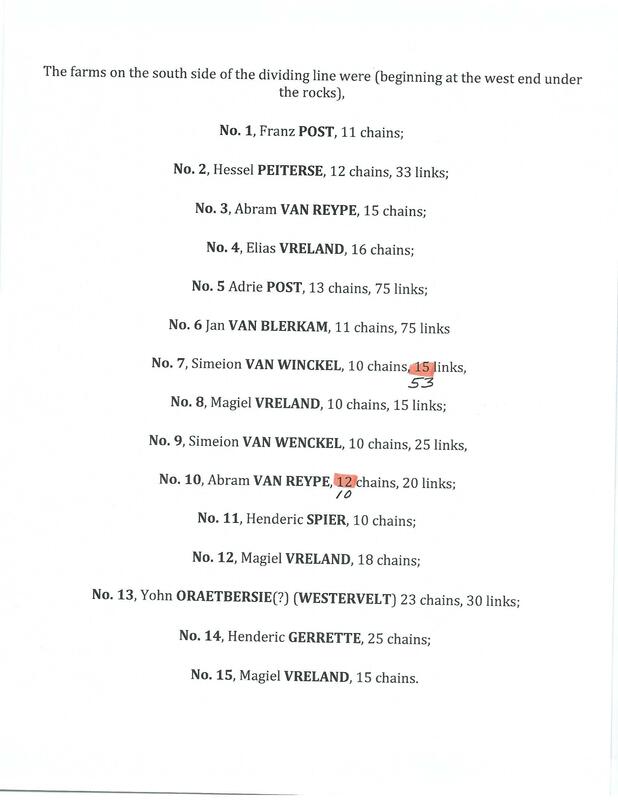 15, Magiel VRELAND, 15 chains. In this interesting map, the dividing line east and west–which we may designate Broadway, though there was not Broadway or any other street than–is bisected at about the middle of the map by a straight line which Judge Simmons says is the old “York Road” or road to New York, which is perpetuated by the present “York Avenue.” This road ran south into what is now Willis Street, past Vreeland Avenue, and straight over the hill to the river. At the point of intersection of the two lines spoken of lay the farms of Simeion VAN WINCKEL and Magiel VRELAND, on the south, and Abram THOMASSE, and Henderic SPIER on the north. No doubt the transcript we have given of this valuable old map will be read with great interest by all the denizens of the great city which has now absorbed these ancient farms, and especially by the many descendant residents here of the honored pioneers who more than a hundred and seventy-two years ago owned the lands of the “Boght.” –Press. *UPDATE-There is some updated information concerning this map. Thanks to Tony DeCondo of the Paterson Museum for the updated information. The following links show the corrections. The numbers highlighted are the old numbers and the new numbers are indicated below. Source: Nelson, William, History of the City of Paterson and the County of Passaic, The Press Printing and Publishing Co., Paterson, NJ, 1901, pg 71.